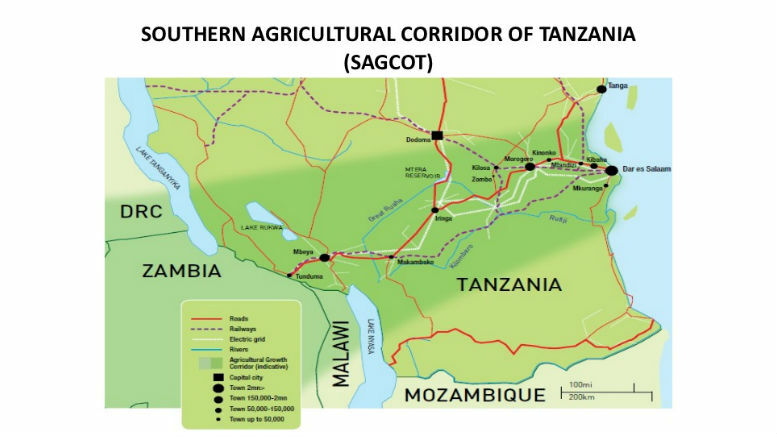 The Southern Agricultural Growth Corridor of Tanzania (SAGCOT), initiated in 2010, is a public-private partnership that aims to further develop the Tanzania agricultural sector through agribusiness investments in the country’s southern corridor. SAGCOT promotes clusters of profitable agricultural farming and services businesses, with major benefits for smallholder farmers and local communities. By catalyzing large volumes of responsible private investment, the initiative aims to deliver rapid and sustainable agricultural growth and thereby tackle food security, poverty reduction and reduced vulnerability to climate change. By 2030, SAGCOT partners seek to bring 350,000 hectares of land into profitable production, transition 100,000 small-scale farmers into commercial farming, create 420,000 new employment opportunities, lift 2m people out of poverty, and generate USD1.2 b in annual farming revenue. In March 2016, the WB approved a USD 70m SAGCOT Investment Project to support the agricultural sector of Tanzania and strengthen it by linking smallholder farmers to agribusiness for boosting incomes and job-led growth. In June 2016, SAGCOT awarded 5 local agro-investors with USD700,000 to expand agro production activities.